Last month myself and a group of colleagues travelled South to Beaufort on a tour of duty. After about an hour of driving, we passed by Kimanis, Papar. This is the location of the (soon-to-be) biggest - designed for 300MW - power plants in Sabah to address the power supply issue in the state. It is still in the early stage of construction. Not exactly the Power Plant but this SOGT project site should give you an idea of where the generators will be sited. The power plant costs about RM1.5 billion (US$485 mil) to build and it is owned by Kimanis Power Sdn Bhd (KPSB), a 60:40 joint-venture initiative between Petronas Gas Berhad and NRG Consortium (Sabah) Sdn Bhd, a company under Yayasan Sabah. The gas-fuelled plant consists of 3 nos of 100MW generating blocks, each of which consists of Gas Turbine Generator (GTG), Heat Recovery Steam Generator (HRSG) and Steam Turbine Generator (STG). This makes it 300MW in total and this should take care of at least short term electricity demand in Sabah. But it is also understood that the plant has allocated a space for future upgrading and the expansion infrastructure can cater for additional 100MW of supply. According to SESB's data, Sabah recorded a highest peak demand (MD) of 830MW on June 28, 2011. The independent power producer (IPP) could not have came at a better time. Engineering, procurement, construction and commissioning works for the combined cycle gas power plant is to be done by Synerlitz Sdn Bhd (Taiwan owned) and SCHB Engineering Services (a subsidiary of Suria Capital Holdings Berhad). 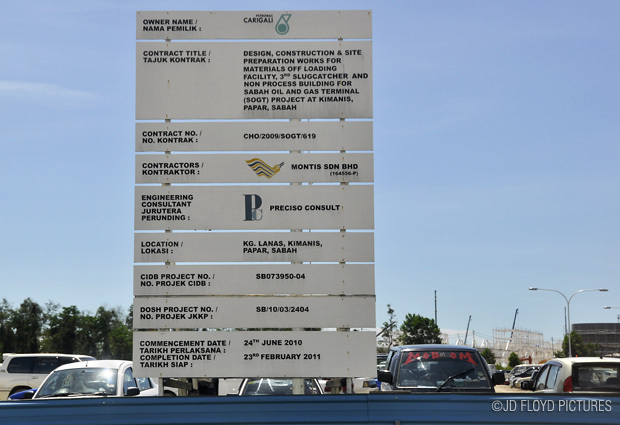 The Kimanis Power Plant project is one of the bigger spin-off activities from the proposed Sabah Onshore Gas Terminal (SOGT) project, located in Kimanis and implemented by Petronas Carigali Sdn Bhd. Site preparation works for the SOGT project was undertaken by Montis Sdn Bhd, a Penampang-based local company. SOGT site preparation works - local company benefited. 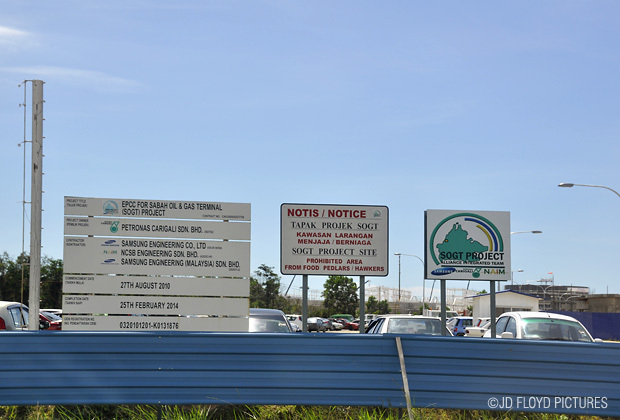 The power plant project is scheduled for full completion in 32 months' time, from Apr 1, 2011 and the first commercial operation date for the first generating block is December 1, 2013. Once completed, the Kimanis Power Plant will be the biggest IPP plant Sabah (until such time that a bigger one comes in) and it will take great responsibility in supplying reliable and clean electricity to Malaysians in Sabah. The short term energy demand should be taken care of for now but more such facilities must be constructed to meet the fast increasing peak demand. According to SESB, electricity demand in Sabah is expected to reach 1,500 MW by the year 2020. Preferably, there should also be some investment in renewable energy such as hydroelectric, biomass/biogas and solar photovoltaic. 1 of the company u mention is the place where i work. the one u talk about in the entry is Kimanis Power Plant the 300MW, it is located beside SOGT. SOGT is the one who will supply gas to KPP. And SOGT site is wayyyyy bigger than KPP. @Cinoi. Thanks for the insight. Good to have someone working in one of the companies reading this. I suppose SOGT would be the biggest facility in and around Kimanis & papar, once completed. I'm surprised the Govt (through Petronas) appoint a Korean company, Samsung Engineering Co. as the main contractor. Don't we have suitable and capable local Oil & Gas players in Msia? YEah, and KPP (KImanis Power Plant) the main contractor is Taiwan. So that put a puzzled in me too.